Large bushy evergreen with large, leathery dark green leaves. 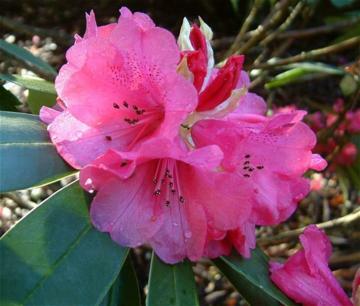 Clusters of very showy flowers of deep pink with a darker spots inside, produced very early in the season, being in full flower from mid January. Moist, well drained humus rich acid soil in part shade. Hybrid of R. 'Cornubia' x R. sutchuenense.